In more than 20 years of teaching Social Studies, one thing has held true over time: Students that are engaged, remember what they learn. I was exposed to a simulation when I was student teaching in Forest City Iowa. It had six fictional countries and it ended with war or peace. I thought it would be more fun and educational if you used the real countries and created objectives for each to accomplish. The first thing I do is open the Leader's Spreadsheet. With my class roster in hand, I start by putting marks by the students that I think would be the best leaders. Then I assign them to the most important roles: Presidents of Germany, Great Britain, France, Russia, Austria-Hungary and Italy. Once these positions have been chosen, I usually group some of the smaller countries together: (Romania and Japan), (Serbia, Greece, Montenegro), (Portugal and Belgium). When I have a larger class, I assign Foreign Ministers to the larger countries. These students are may be less outgoing or may not want to take leadership positions, but will be very active negotiating and advising the presidents. The binders are made for each country: Student Overview, World Situation Summary, Alliance Map, Rules of the WWI Simulation and individual Top Secret Documents. Cover Pages and spine inserts make their "Top Secret" Documents look official. Flags are taped to the front of student's desks to identify which country they represent. Day 1 1913: I call this Orientation Day. I use a Keynote Presentation to explain the rules of the simulation and give examples. My class periods are roughly 40 minutes long- in case your wondering. When I finish the presentation, I announce a news flash has come off the wire! Then I hand out the World Times article on the Assassination of the Archduke Francis Ferdinand. Then I assign speeches to the leaders of Austria-Hungary and Serbia which will be read in front of the class the next day (1914) With the remaining time left, students are allowed to begin negotiating, making alliances and planning their strategy. Day 2 1914: The class starts off with speeches from Serbia and Austria-Hungary. After the speeches, I ask if anyone wants to Mobilize? One country mobilizes and like a chain reaction, their neighbors mobilize until everyone that can mobilize does. Seeing those troops appear on the map forces countries to be prepared out of fear. At this point, the simulation is in the student's hands. This is the part that scares a lot of teachers. We have a system of turns: Central Powers go first followed by the Allies and finally the Neutrals. Then the process keeps cycling through until the bell rings. We will pick up wherever we left off the next day (1915) Inside a turn: we start with Central Powers War. 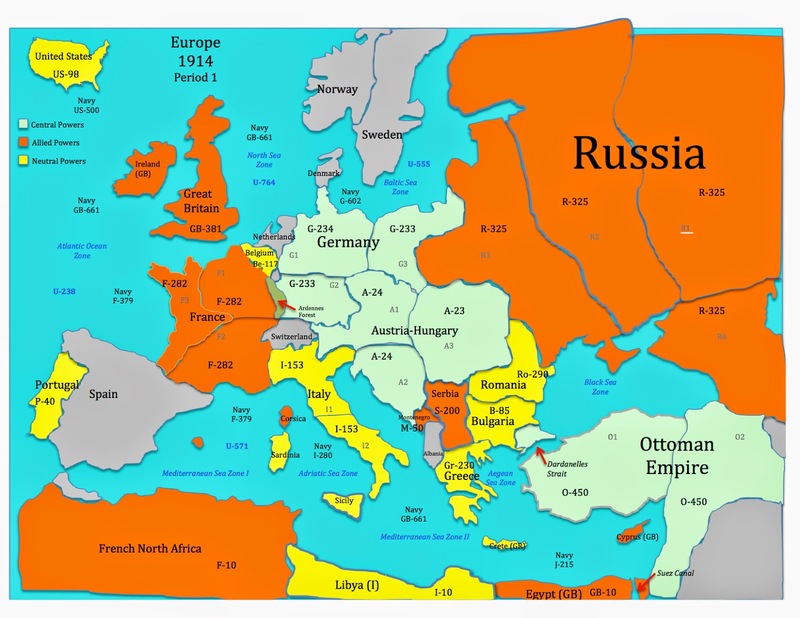 The Central Powers Countries have to declare war during this time. Once they are done declaring war, The Allied Powers and then the Neutrals do the same. This process repeats over and over as many times as we can during the period. If the students believe one side is stalling, they can invoke the ten minute time limit rule. After the class period ends, I take submarine casualties on Allied ships and mobilize the countries who mobilized for the next day. Then I save the maps as PDF's and post them to Moodle for students. Day 3 1915: World Times Article on the Sinking of the Lusitania. Poison Gas Certificates are handed out to Germany, France and Great Britain. Battles, meetings, diplomacy, negotiations all continue: Day 4 1916, Day 5 1917 and Day 6 1918. Substantive conversations are going on all over the room and especially outside of class. The game becomes emotional as countries try to achieve objectives or even survive.